Fantasy Flight Games is proud to announce So Be It, the fourth Force Pack in the Endor cycle for Star Wars™: The Card Game! The Rebel and Imperial fleets meet in deadly interstellar battle above the Sanctuary Moon of Endor. A few noble heroes infiltrate the palace of Jabba the Hutt in a desperate attempt to rescue their captured friend. In the darkest places of the galaxy, evil things stir. In So Be It, you can continue to relive the most iconic moments of Return of the Jedi. 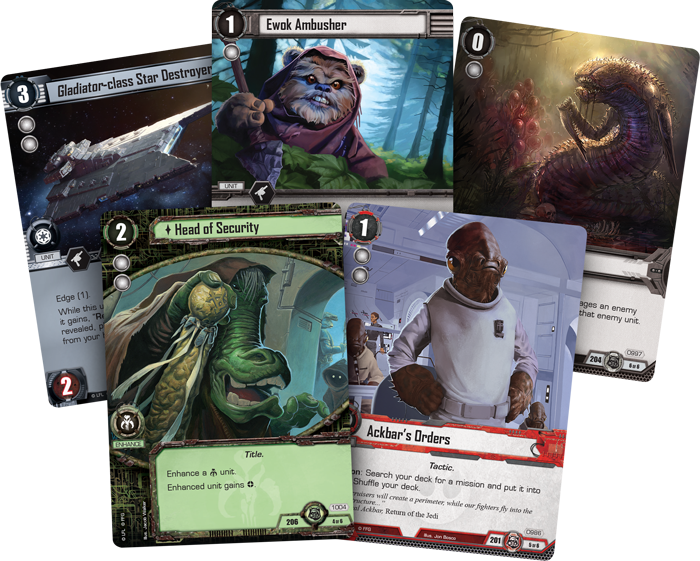 Like the other Force Packs of the Endor cycle, this Force Pack introduces new mission cards to shake up the conflict phase, new fate cards that increase the tension of every edge battle, and new neutral objective sets to expand your deckbuilding options. Here, you’ll find iconic characters such as Admiral Ackbar and Lando Calrissian in disguise as Tamtel Skreej. Whether you’re helping the Empire complete the second Death Star or leading a Rebel assault on the shield generator, So Be It welcomes you into the most thrilling moments of Return of the Jedi. Countless alien species inhabit the galaxy, shaping the growth of their civilizations and advancing to the stars. Yet some creatures were created for far darker purposes. They have no purpose other than a mindless devotion to their evil masters. With So Be It, you can summon more Sithspawn creatures to join your forces and serve the dark side! Since this objective set centers on creatures twisted and formed by the dark side, it’s fitting that the set contains three copies of the Sith Wyrm (So Be It, 995). 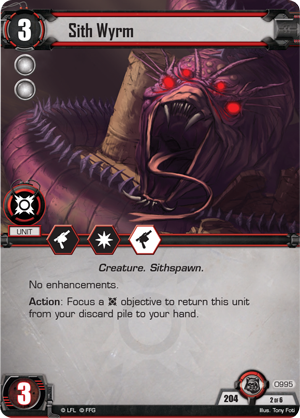 This Sithspawn unit can be a formidable fighter on attack or defense, and your opponent will never be able to get rid of your Sith Wyrms forever. 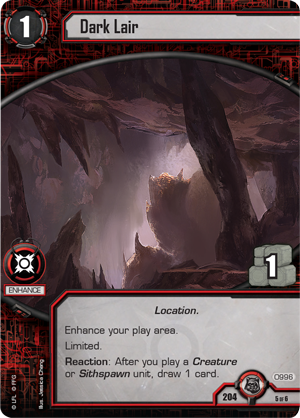 As an Action, you can focus any one of your Sith objectives to return the Sith Wyrm from your discard pile to your hand! Not only does this ensure that you always have a good defensive unit to play, you may even use this ability to boost your strength in crucial edge battles. By gaining an additional two-Force icon card before the edge battle, you just might be able to turn defeat into victory. 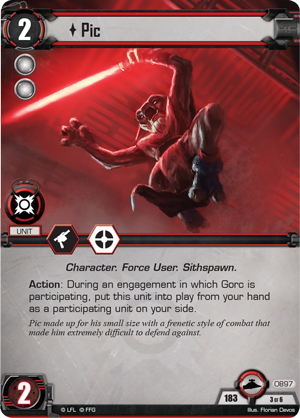 Furthermore, you can commit your Sith Wyrms to edge battles without fear, knowing that you can always bring them back to your hand if you need them later. 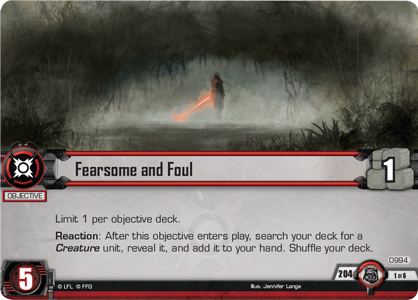 With three Sith Wyrms in your deck, you have a good chance of finding one early on, but you can also call these dark Creatures to your side with Fearsome and Foul (So Be It, 994). After you reveal this objective, you can search your deck for any Creature unit and put it into your hand. By summoning your Sith Wyrms from your deck, you can unleash these loathsome creatures on the light side. 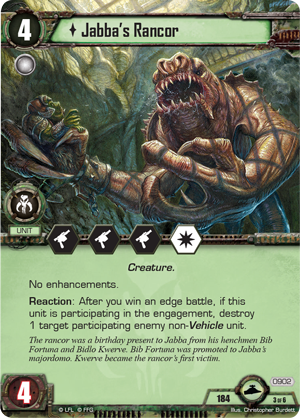 Alternatively, you could search your deck for a different powerful Creature like Jabba's Rancor (Imperial Entanglements, 902). Of course, as you further your cunning plans throughout the galaxy, you’ll want to get the maximum advantage from every Creature you play. To that end, you may house your Sith Wyrms in a Dark Lair (So Be It, 996). 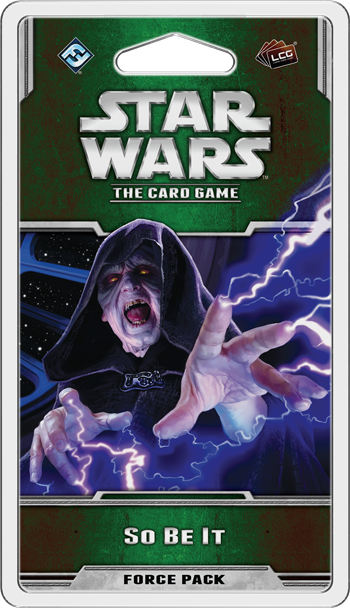 This enhancement provides an additional resource, but more importantly, it reads, “Reaction: After you play a Creature or Sithspawn unit, draw 1 card.” With the Dark Lair in play, you can draw additional cards easily, whether you play a Sith Wyrm or Sithspawn warriors like Gorc (Imperial Entanglements, 896) and Pic (Imperial Entanglements, 897). When you can play terrifying Creatures and Sithspawn and draw more cards in the same breath, you’re already halfway to crushing the light side’s pitiful efforts to destroy you. 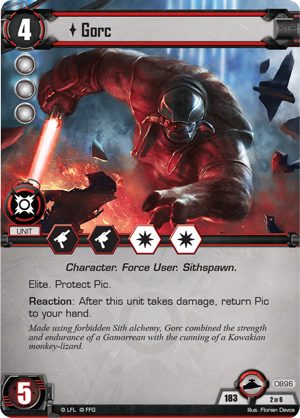 Finally, your Sith Wyrms need a way to surprise your light side opponent and turn the tide of battle suddenly in your favor. You can accomplish this goal easily with Feeding Frenzy (So Be It, 997). This event is free to play, and after one of your Creature units damages an enemy Character or Creature unit, you can destroy that enemy unit instead! 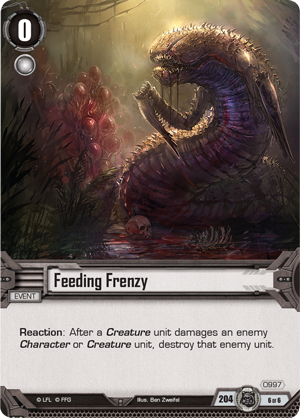 Even the smallest scratch from a Sith Wyrm can prove deadly, letting you take down your opponent’s most dangerous units with a single blow. As Sithspawn monsters slither through the shadows and the Imperial Navy musters its martial might, the Rebel Alliance struggles desperately against the power of the Empire in the skies above Endor. Choose your favorite affiliation and join the fight for your cause in So Be It, the fourth Force Pack in the Endor cycle. Look for So Be It at your local retailer in the first quarter of 2016!